Left: Dr. Sally Rockey at the public meeting of FFAR stakeholders. 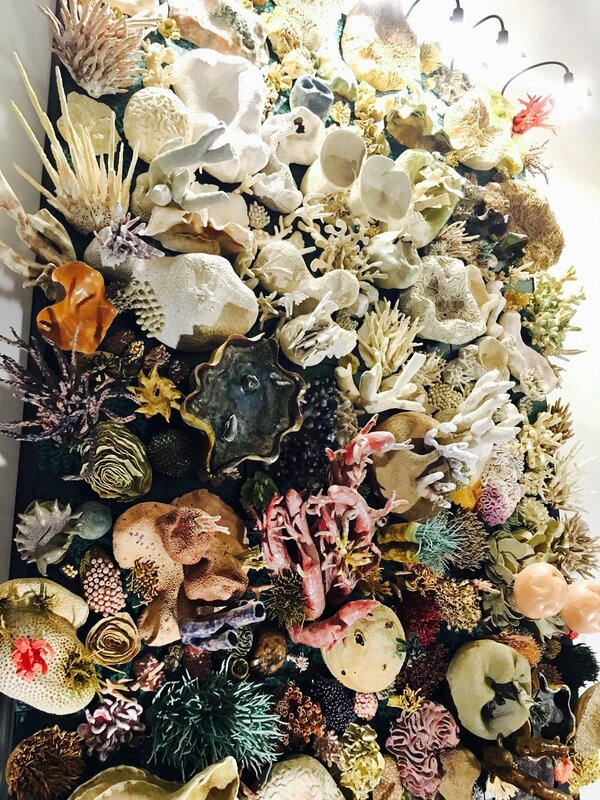 Right: coral art at the AAAS headquarters. I, along with three other graduate students of the inaugural class of Graduate Fellows of the Center for Environmental Farming Systems from NC State visited Washington D.C. in early October to learn more about science policy as it relates to sustainable agriculture. We were fortunate to meet with several program leaders from USDA NIFA, interacted a great deal the board of directors of the Foundation for Food and Agriculture, toured the Capitol building, and met with the Food and Agriculture team at the Union of Concerned Scientists. It was illuminating to hear from so many different perspectives and world views about how to tackle challenges in food security through research and policy. One common theme across our meetings with these groups was that the inherent complexity and interactions between the field of agriculture and the rest of the world means that we need to train more scientists who think across disciplinary, cultural, and geographic borders. I left D.C. with a lot to ponder! In Science Policy Tags CEFS, Washington D.C.